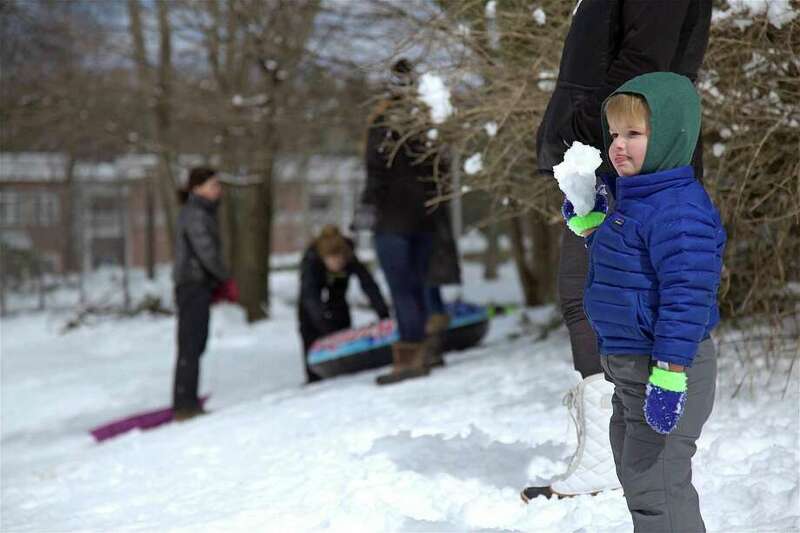 Everett Pritchard, 2, of Fairfield, enjoys the snow at Greens Farms School in Westport on Monday, March 4. Olivia S. Hawkins was named to the 2018 fall semester dean’s list at the University of Minnesota Twin Cities. Mia Hermsen was named to the dean’s list at Viriginia Polytechnic Institute and State University for the 2018 semester. Jake Haney, Max Kutsch, Gazang Abdulla and Michael Acciarino were named to Hofstra University’s fall 2018 dean’s list. The following Fairfield University students were named to the fall 2018 dean’s list: Ali Al Rawendoozi, Dalya Al Rawendoozi, Wilson Alexei, Emilse Almanza, Alzbeta Andrikova, Madeline Baer, Natalia Baeza Carbonell, Enkh Amgalan Batburen, Kayla Beck, Katherine Biardi, Nicolas Black, Mariana Brandao, Lam Bui, Nicole Bus, Jessica Castillo, Chizimuzo Chibuko, James Clemente, Christian Colon, Sean Coyle, Julia Crews, Jose de Bethencourt Fernandez, Rachel Demers, Amira Ebrahim, Luan Fonseca Lamas, Henrique Geraldi Lopes, Ali Haidar, Raqibul Haque, Annie Huber, Ymke Huisman, Nwachukwu Ibekwe, Malen Iglesias, Olivia Kane, Jonathan Kasibabu, Aidas Kavaliauskas, Benjamin Kebbell, Ha Le, Thanh Le, Caroline Mahar, Aina March Razakamanantsoa, Olivia Marcou, Lejla Markovic, Brian Martyn, Eryiel Joyce Mascardo, Emma Matlach, Elisabeth McMahon, Emma McMahon, Matija Milin, Robert Mulderry, Bridgit Murray, Jonathan Myers, Natalia Nawrocka, Quan Nguyen, Trang Nguyen, Trinh Nguyen, Marcus Nordgard, Shea O'Donnell, Barry O'Gorman, Bridget O'Leary, Erin O'Leary, Luzi Leonie Persiehl, Lucie Picard, Sonja Radulovic, Jolanda Richter, Andrew Rodgers, Enaea Sahloul, Nicolle Salazar Munoz, Teresa Sauer, Nathan Schmidt, Christopher Smaldone, Blancamari Somoza, Tobenna Ugwu, James Ulness, Jonas Simon Vergin, Aarushi Vijay, Nhi Vu, Julia Warman, Jianling Wu, Kayla Yaverski, Luka Zedginidze, Alexander Zeko, Paul duToit and Mimi Loughlin. Sarah Delmoor was named to the fall 2018 provost’s list at Hofstra University. Daniel Telper was named to the fall 2018 dean’s list at Bates College. Emma Greenwood, Laura Judd and Neal Mintz were named to the fall 2018 dean’s list at Washington University in St. Louis. Paul Santandrea was named to the fall 2018 dean’s list at Western New England University. The following students were named to the fall 2018 dean’s list at Colgate University: Tenzin Dickyi, Lydia McGrath, Emily Christenson and Clare Sullivan. Ingrid Backe, Trey Spadone, Charlotte Clifford, Conner Doyle and George Crawford earned a dean’s award with distinction for the fall 2018 semester at Colgate University. Ella Corcoran, Tighe Jorgensen, Erinn McKenna and Jesse Spears were named to the fall 2018 dean’s list at Purchase College. Kate Palmer, Kaleigh Townsend, Anna Kaiser and Drew Delach were named to the first semester 2018-19 dean’s list at Miami University in Ohio. Emma Barron was named to the president’s list for fall 2018 at Miami University in Ohio. Melanie Albright, Lauren Dewitt and Isabella Schichter were named to the fall 2018 dean’s list at Emmanuel College. The following students were named to the fall 2018 dean’s list at James Madison University: Julia Brown, Emma Gulick, Christopher Jones, Shayne Power and Katherine Rigione. Brianna Rose Auray, Paul A. Cipollaro and Jacquelyn Mary Konstanty were named to the fall 2018 dean’s list at Clemson University. Margaux Atkins and Daniel Sanfilippo were named to the fall 2018 dean’s list at Springfield College. The following students were named to the fall 2018 dean’s list at Connecticut College: William Cannon, Kevin Hyland, Claire Langdon, Lauren McNamara, Philip Nicholson, Caroline Pangallo, Sara Abbazia, Luke Pacilio and Alexandra Wagner. The following students were named to the fall 2018 dean’s list at Tufts University: Andres Almanza, Kyle Burton, Emil Friis, Meghan Podolsky, Sarah Poling, Gillian Rooney, Elizabeth Sander and Devon Valera. The following students were named to the fall 2018 dean’s list at the Rochester Institute of Technology: Stephanie Dineen, Rose Parker, Rebekah Snitkoff, Christian Martin, Patrick Salts, Robert Maron and Samila Sabovic. Philip Nesbitt was named to the fall 2018 dean’s list at Azusa Pacific University. Danielle Veith was named to the fall 2018 dean’s list at Bryant University. The following students were named to the fall 2018 dean’s list at the University of Vermont: Kristen Brown, Nicholas Fech, Cameron Nash, Damien Socia and Julia Kim. The following students were named to the fall 2018 dean’s list at Roger Williams University: Sydney Burr, Jordan Chesek, Leah Hintz, Caroline Naspo, Philip Neamonitis, Liam Raftery, Brian Schiller and Margaret Siebert. Christopher Landry was named to the fall 2018 dean’s list at the University of New England. The following students wre named to the fall 2018 dean’s list at Bucknell University: Jacopo Baldi, Nicole Bilotto, Tom Gannon, Allie O'Connell, Remi Smith, Ryan Gannon and Max Chandler. The following students were named to the fall 2018 dean’s list at Lehigh University: Zachary Day, Danielle Fox, Morgan McCuaig, Meredith Nerreau, Jason Nerreau, Andrea Ranzilla and Nicole Vaccarella.